My photographic work – »Hatmaker« – documents the final decline of the hat industry in Guben – a town that with Polish Gubin straddles the German/Polish border in the Lausitz Region of the former East Germany. 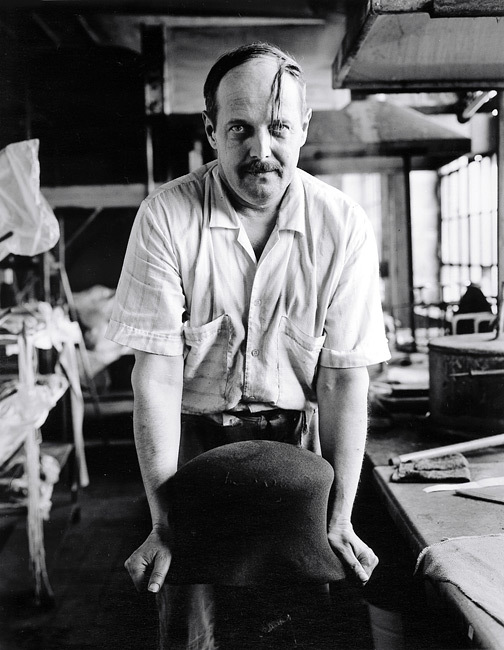 The hat-making industry in Guben dates back to 1822, when Carl Gottlieb Wilke started to produce the world’s first waterproof woolen hat – his own invention – in the backyard of his house. Just a century later, in 1922, the industry had grown to employ 20,000 of Guben’s inhabitants in all aspects of millinery. The decline of Guben’s hat industry began shortly before the Second World War. Most of the hat factories and supporting businesses were owned by Jewish families, and they were confiscated by the Nazis. During the War, hat production was decreased, as military goods and clothing were given priority. After the war, the remaining factories were consolidated under the Soviet occupation into five state-owned factories with a total of about 1,200 hat makers. Nevertheless, Guben remained Germany’s largest producer of hats. As late as 1990, six hundred workers continued making hats in Guben’s aging factories. In 1992, I discovered Guben’s last remaining hat factory. Having survived the reunification of Germany and the complete breakdown of the eastern market, it continued to employ 70 hat makers. That year I carried out my first photo reportage in the hat factory, illustrating several newspaper articles about the problems and ongoing decline of the factory. In 1999, I was asked by the Association of Museums in Brandenburg to make a new, broader photo documentation of the hat factory. This was to coincide with plans to move production from the old, run-down building into a new, smaller, cost-efficient hall, which was to be built outside Guben’s town limits. The Association asked me to document the working situation of the few remaining employees in the cavernous old building, whose dimensions and capacity reflected a time when no properly dressed man dreamed of going onto the street without a hat. In the beginning I felt like an intruder into their forgotten world. But over a period of eight months I worked closely with the remaining ten hat makers, who had to freeze their movements and pose for me, since I was working with a large-format camera. In November 1999, we were all surprised and bitterly disappointed to learn that the plans to build the new factory had collapsed, and that the entire hat production would cease permanently by year’s end. Several times during preparations for the first »Hatmaker« exhibition in Guben I had occasion to once again meet the ten hat makers that I had photographed. Nine of them were still unemployed; one was training to become a gardener. I’ve entitled this exhibition »Hatmaker« as a tribute to them and their profession – a profession in which they are unlikely ever to work again. Since I kept in contact with some of the hat makers, and was curious to learn more about the polish part of the »Gubin« town, I continued my work in the following two years for the exhibition »Guben/Gubin«.